Liberty Walk, a Japanese tuner well-known for its body kits and performance upgrades for supercars, has now got its hands on the Suzuki Jimny. 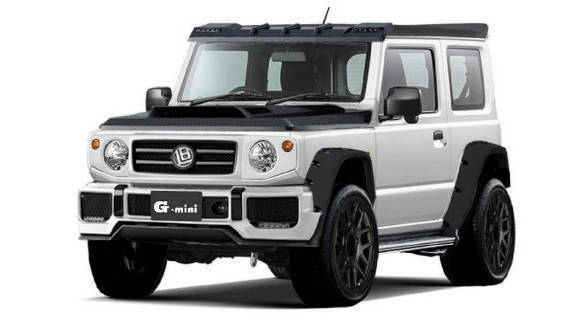 The result of this is a Jimny that looks more like a mini Mercedes-Benz G-Class than anything else. Called the G-Mini, the modded Jimny gets wider fender flares, a new bumper with squared-off air intakes and LED DRLs, new front grille with LB badging, a carbon-fibre bonnet with a massive air intake and a two-tone paint job. Details are scarce and it is not known if the G-Mini gets any performance upgrades to go with the inspired styling. The Japan-spec Jimny SUV comes with a 0.66litre R06A turbo engine, while the Jimny SUV that will be sold in the international markets comes with a 1.5-litre K15B engine, replacing the 1.3L unit of the previous model. The 1.5L petrol engine makes 100PS at 6,000rpm and generates 130Nm at 4,000rpm, which makes is an addition of 17PS and 20Nm over the previous. The new-gen Jimny continues to be a 2-door design and is a serious off-roader with ladder frame construction, four-wheel drive with low-range gearing and high-profile tyres. Also, Suzuki provides the Jimny with a host of customisation options in Japan.